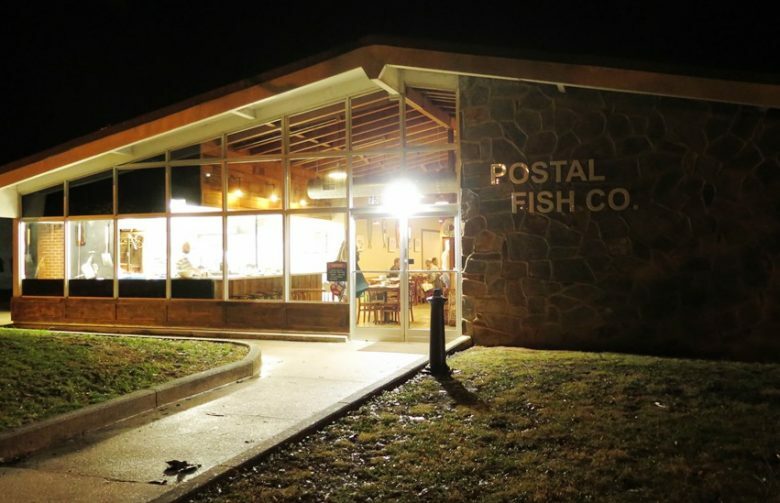 Heading over to downtown Pittsboro on a Wednesday night, Postal Fish Company is located right off of Hillsboro Street and near City Tap, an old-school beer bar. It was a wet and cold night, Postal Fish Company is well lit up on this quiet street, beckoning like a foodie beacon! Converted from an older post office, you’ll immediately recognize the retro stone facing and ranch-style construction up front. Inside, the space is open and slightly industrial with a polished concrete floor, open faced beams overhead and a bar to the right. The space reminds me a bit of the Piedmont in Durham, a rustic but modern cafe set-up. To the left you’ll find a small kitchen and oyster bar manned by owners James Clark and Bill Hartley. A small group of bloggers are greeted by the two and we’re seated right near the kitchen to catch all the action. At the oyster bar, Bill and James provide us the back-story to the restaurant. 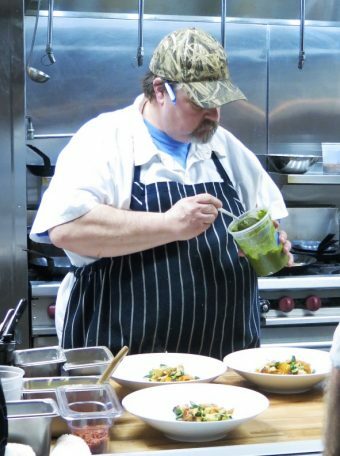 Working together for over 10 years at various restaurants in the Carolinas, Bill and James had worked on this local seafood concept for over four years. 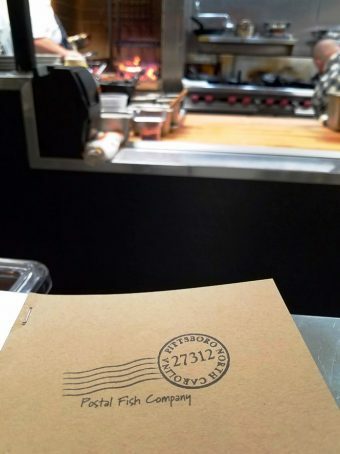 Their vision in bringing fresh, under-utilized seafood to the Triangle and being part of the growing food community was finally crystallized in October of 2017 in this converted post office. Both men live nearby in Pittsboro and outside of regular forays to the coast for fresh fish and seafood, spend a lot of time right in the neighborhood! 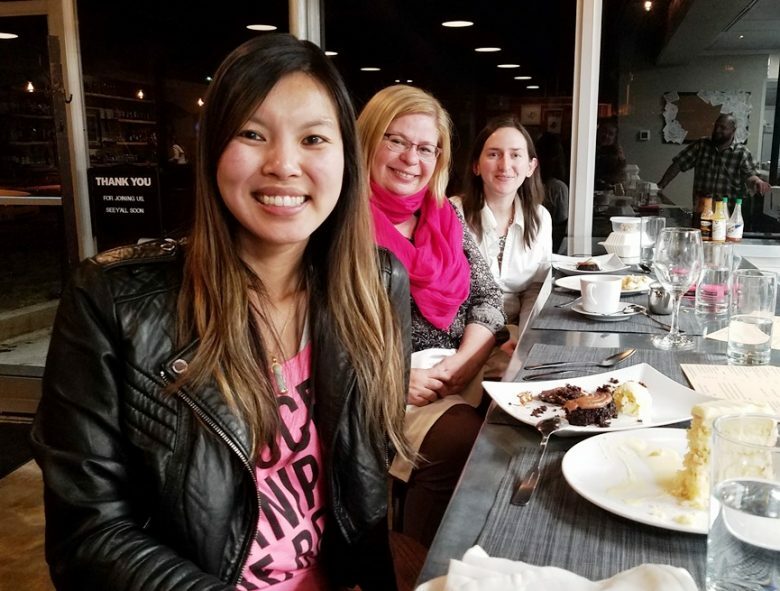 And while they considered opening up in Chapel Hill given their experience at the Carolina Inn, it just made more sense to start their dream right here in downtown Pittsboro. Much of the fresh seafood is cooked at a wood grill in back which must be constantly tended to. And their seasonal menu changes regularly which means that it sometimes must be printed on a daily basis. I had been warned to come hungry to this media event and it’s because we were about to be treated to a multi-course meal, highlighting many of the favorites from Postal Fish Company’s menu. Bring on the stretchy pants! Over the course of the next two hours, Bill and James treated the group to an amazing array of seafood dishes. 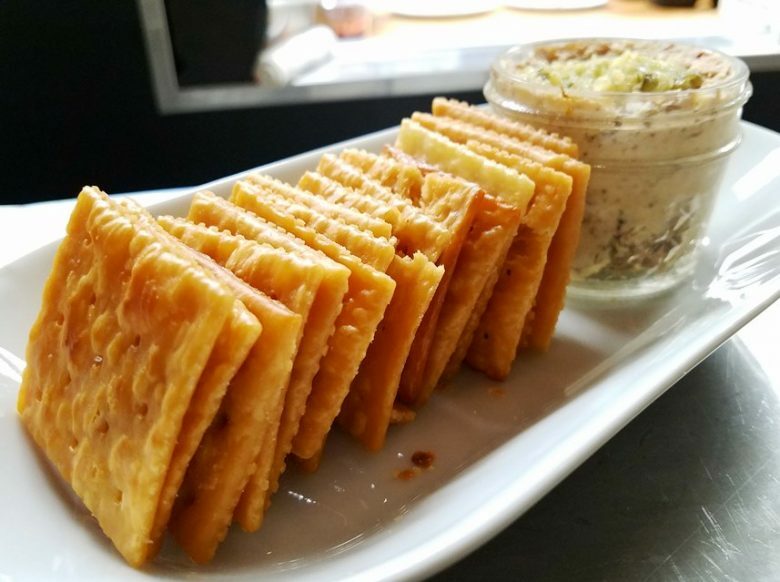 Some highlights for me included a fantastic smoked catfish dip and fried saltines, simple but a wonderful presentation. And their garlic shrimp?! Fantastically pungent garlic highlighting the fresh, sweet meat of Carolina shrimp, loved it. I’d also highly recommend the Scottish oysters, a play on the Scottish egg! But instead of an egg, Postal Fish Company inserts a soft, plump oyster into a sausage and bread crumb wrap, delicious! 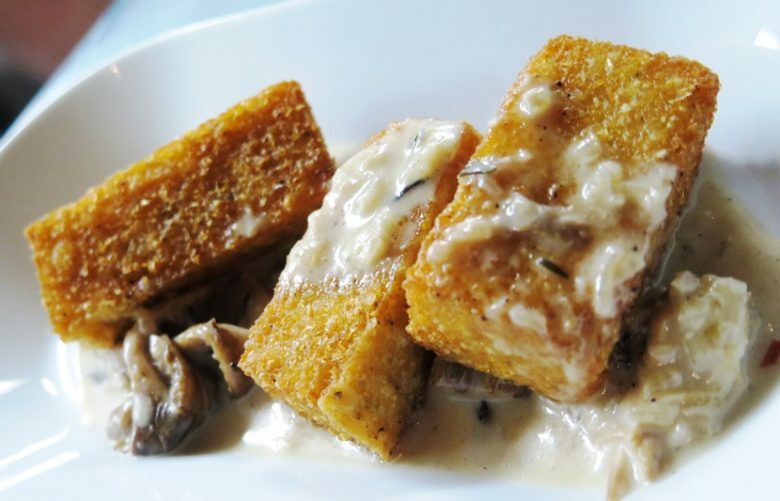 The fried grits are served up as lightly browned sticks and alongside “mushroom chowder”, a fun and savory play on fried risotto. We were also able to sample some fresh Sounders oysters, SC mussels in a lemon-thyme cream sauce and Jolthead porgy crudo, wow! 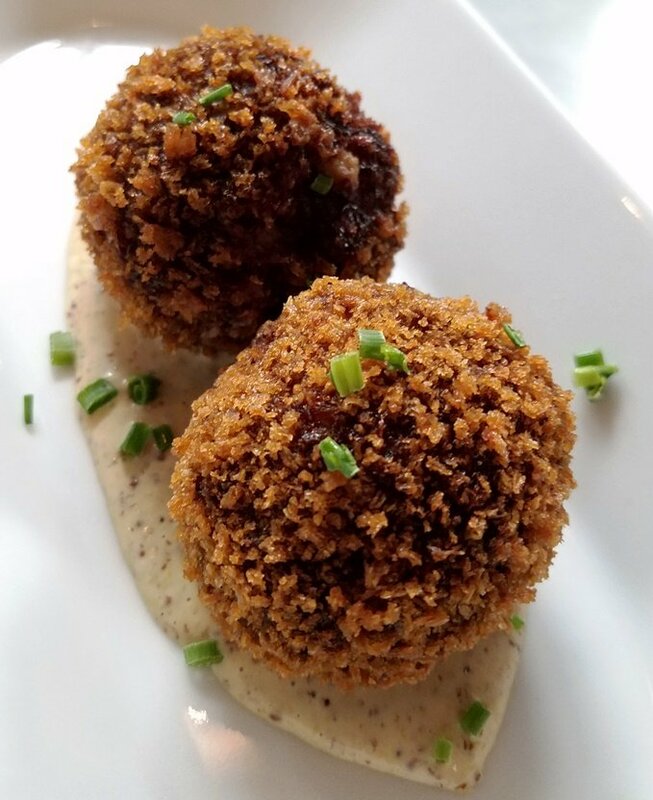 Given the seasonal menu and creativity in the kitchen, you may not find exactly the same dishes on the menu if you’re to visit Postal Fish Company but I’m pretty certain you’ll get some variation on the deliciousness we experienced. 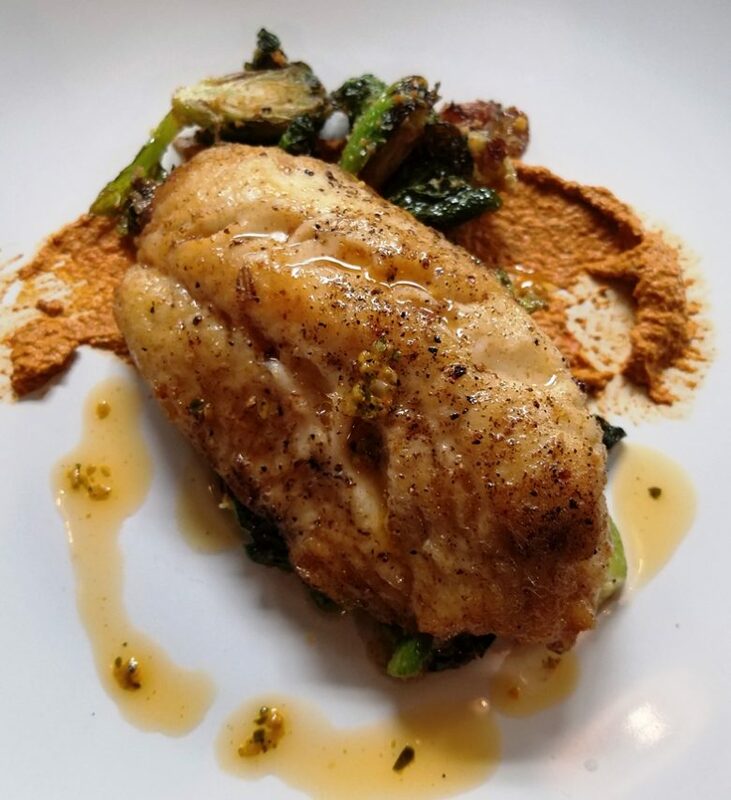 Our main fish dishes included a triggerfish served over brussels sprouts along with a tilefish dish which was my favorite. 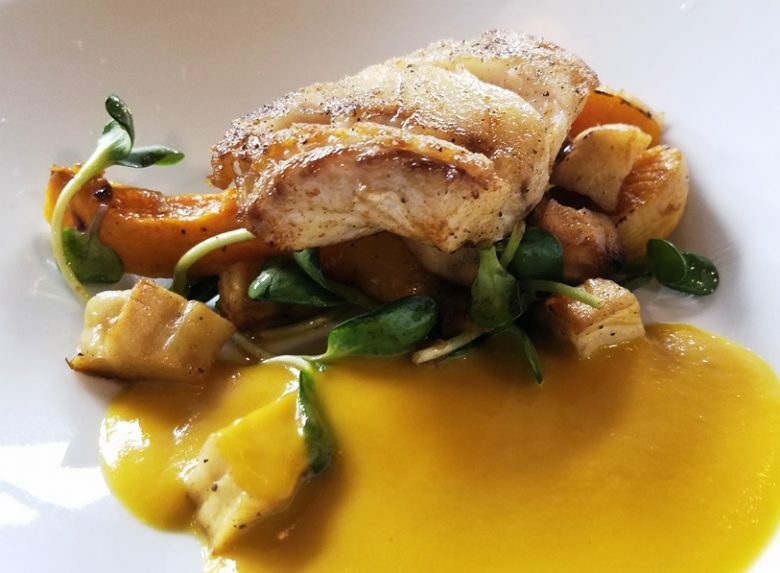 The lightly grilled tilefish was served on top of pureed parsnips along with soft butternut squash which brought a wonderful sweetness to the palate. One thing’s for sure, Bill and James know their way around good fish and how to prepare it, properly. And even after this enormous meal, Bill and James wanted to make sure we tried the desserts at Postal Fish Company. We were treated to a chocolate cake with stout frosting along with a fantastic vanilla cake with coconut cream. 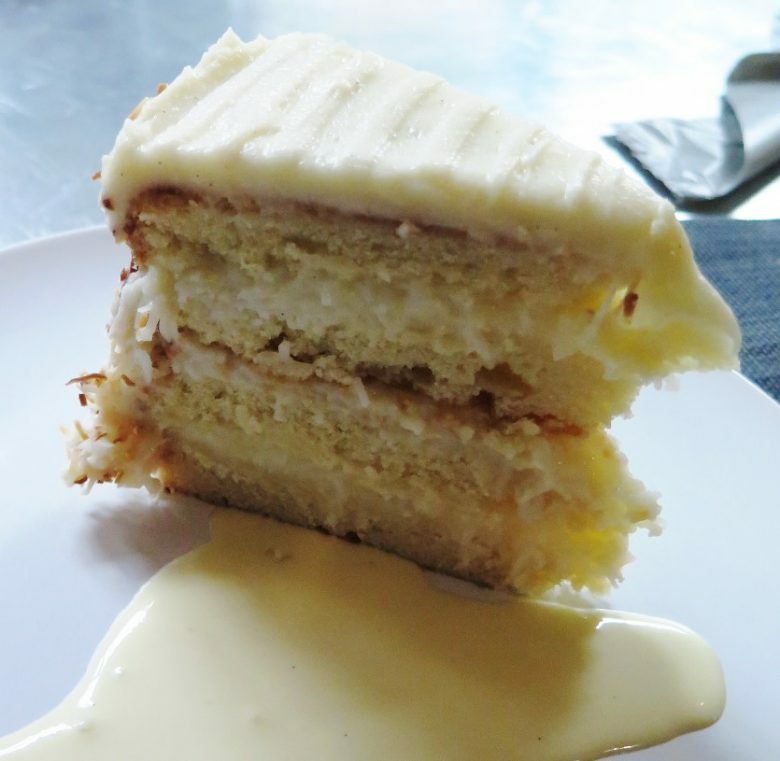 The vanilla cake is composed of thinner layers of cake stacked with soft, coconut-custard making for a rich and creamy bite! Big thumbs up here, apparently the desserts are baked by James’ wife, Postal Fish Company is truly a family business. As we finished our dinner at Postal Fish Company, we thanked Bill and James for their hospitality and wonderful seafood. 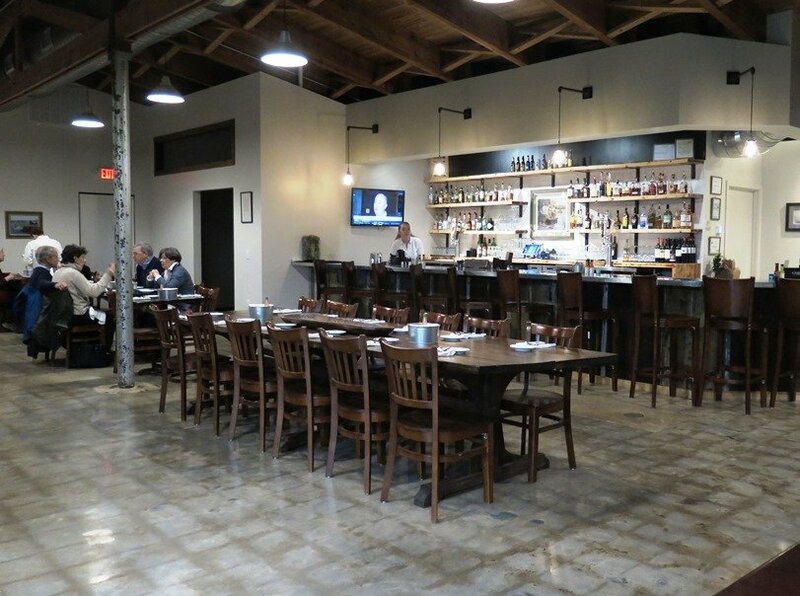 The restaurant was quiet on a rainy Wednesday night and I suspect that not everyone knows about this hidden gem of a seafood restaurant out here in Pittsboro. 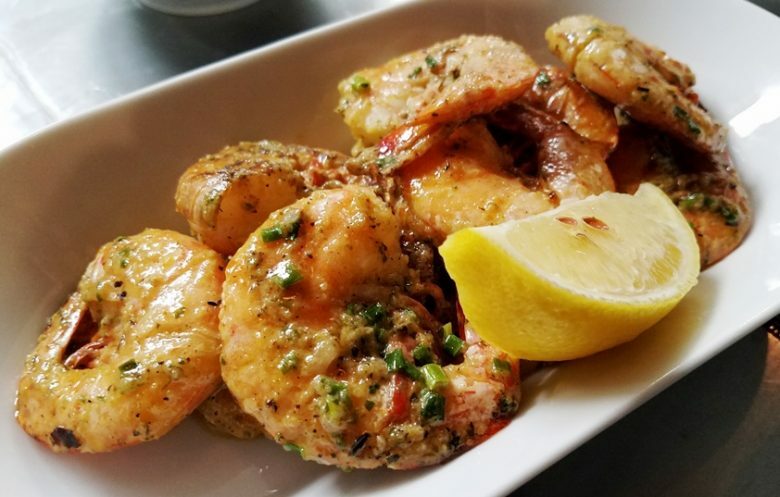 While the food would qualify in my book as upscale seafood, prices at Postal Fish Company are quite reasonable with appetizers in the $7 to $14 range and entrees in the $18 to $25 range. 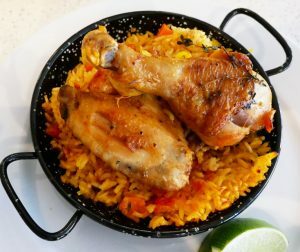 A great dining deal for what you get here! 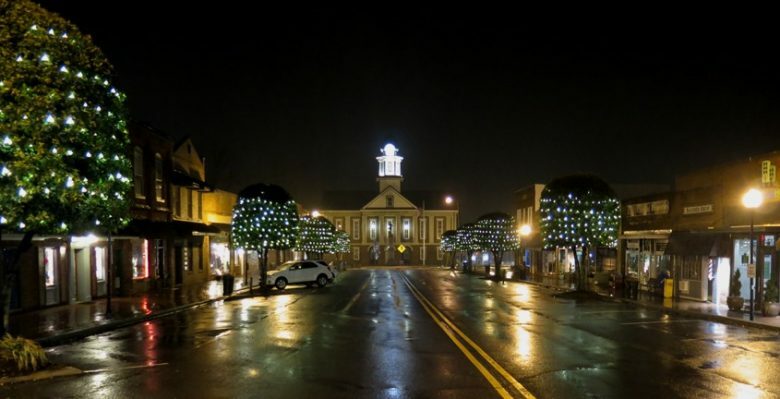 But I am thankful for having such a great restaurant out in Pittsboro. While I may not get out this way that often, Postal Fish Company is a great example of the vibrancy of the local food and restaurant scene. 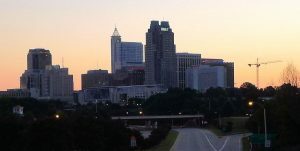 When you’re getting great dining experiences in even the quieter areas of the Triangle, you know that things are going great! So thank you Bill and James, it was a wonderful treat exploring downtown Pittsboro and the fresh seafood at Postal Fish Company! 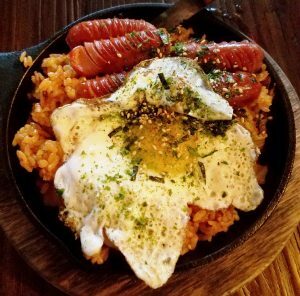 A Newcomers Guide to Thirteen Great Restaurants in Raleigh!